Former Harlem Globetrotter, Meadowlark Lemon, appeared on the Sean Hannity Show Tuesday night, April 29, along with SiriusXM college sports broadcaster, Tim Brando, to discuss Clippers owner Donald Sterling’s racist remarks and NBA commissioner Adam Silver’s swift decision to ban Sterling from the NBA for life along with a $2.5 million fine, the maximum fine allowed under the NBA constitution. All agreed the right decision was made. 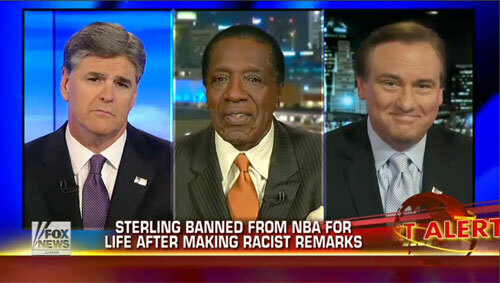 Photo shows Meadowlark Lemon (C) and SiriusXM broadcaster, Tim Brando (R) speaking with Sean Hannity on April 29, 2014 about Clipper’s owner Donald Sterling’s racist remarks and NBA ban. When Sean asked Meadowlark what he thought of the commisioner’s decision, Meadowlark said, “I thought he was right on. He didn’t try to push it off on anybody else. he said you’re banned.” Meadowlark went on to say how painful it was for the players and how he had seen that pain before and how he went to bed with it in his head. Meadowlark & Brando encourage fans to go out in mass and support the players as they enter the playoffs. I appreciate the opportunity Sean Hannity gave me on his show to make a statement and share my personal thoughts. With all of the heartfelt messages of support to the LA Clippers Players, I know they’re going to have a great season! Thanks Sue for writting this great blog! Thank you for sharing your thoughts, Meadowlark. There is no room for this kind of hatred. I’m confident the fans will support the Clippers and hopefully the ownership issue will be resolved.